Deep cleaning formula providing a perfect finish! Glidecoat Nano Polish can be used on gel coat, clear coats, paints, chrome, polished aluminum, plexi glass, glass and all non-porous surfaces. 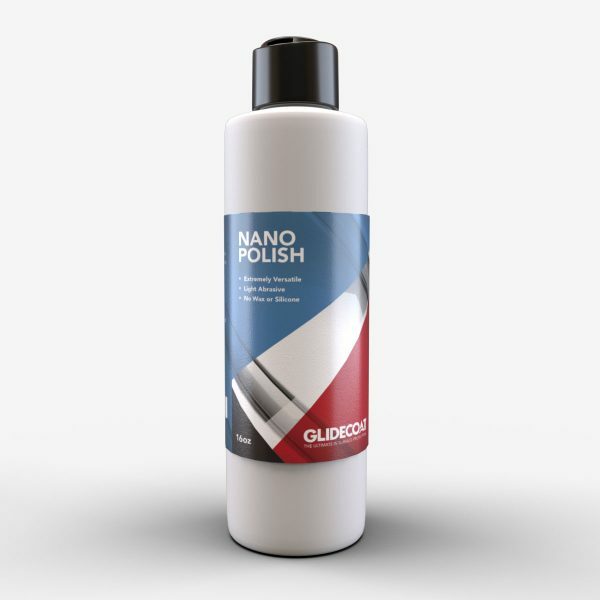 Glidecoat’s Nano Polish offers a fast, easily achievable, perfect finish, using fewer products, and fewer stages than traditional polishing systems, on both fiberglass and marine paint. 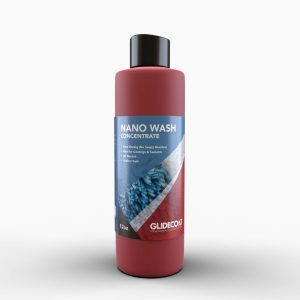 Glidecoat’s Nano polish provides both a deep cleaning action, as well as polishing in one easy application. Only damaged fiberglass or paint molecules are removed by the polish as to not compromise the durability of a yacht’s finish, as harsh polishing compounds do. This product does not contain wax or silicone. Use by hand or by machine in sun or shade. REMOVES: Water spots, light oxidization, swirls and scratches. Make sure that the surface you are working on is not in direct sunlight and ideally cool to the touch. Make sure polishing pads are clean and free from particulates before use. Make sure any surface you are working on is clean and contaminant free otherwise you will introduce new scratches on the surfaces while polishing. If using a rotary tool to apply the polish, in the first instance, try using a medium foam pad. If the results you achieve by doing this are satisfactory then there is no need to use a more aggressive wool pad. When using the wool pad, ensure the fibers do not get clogged by excess product. Clean the pad in a bucket of water or using a jet wash and make sure the pad is dry before use. Always keep a film of Nano Composite Polish on the surface of the pad. 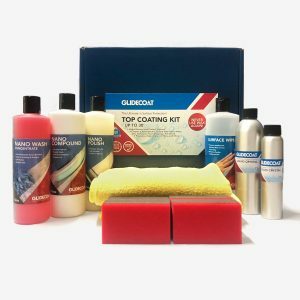 If a pad is used without polish on it, not only will it not be polishing, it may also harm the paintwork or fiberglass. If the polish dries out on the surface as you are polishing, spray the surface with a mist of water and this will reactivate the polish. It is best to polish with a rotary tool at between 900 and 1,200 rotations per minute (rpm). When finishing polishing always use the soft foam pad at a low rpm, this will remove any machine lines caused by the more aggressive wool pad. 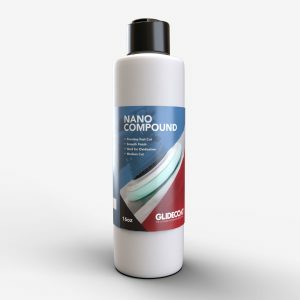 Glidecoat Nano Composite Polish has a shelf life of 2 years from purchase. For best results, use within 6 months of opening. 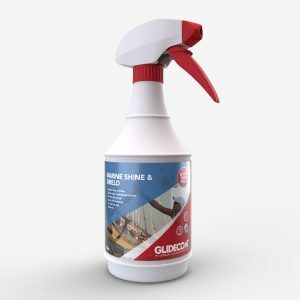 Disclaimer: Please read the official Glidecoat product disclaimer here. Wow, Used this product on 8 year old “Tired” Awlgrip paint job. Worked Awesome and easy to apply with a rotary polisher set at 1000 rpm. Really got a nice shine from a very dull finish. Great price also. I am going to have my boat hauled and do the 46 foot hull. We guarantee to refund any item you are not completely happy with when you return it to us in sale-able condition within 14 days of receipt. When issuing a refund we will need to see proof of your original purchase. Refunds will be credited to your original method of payment. For safety reasons we cannot offer refunds on products that have been opened or used, unless they are faulty or unfit for purpose. Please note, if you purchased our products through another reseller, you will need to return the products to the original place you purchased them. What about my delivery charge? If we have made a mistake on an item sent to you or it is faulty, damaged, of unsatisfactory quality, we will refund the delivery charges you have paid to receive that item, unless it was sent to you with other items which you are not returning. POSSIBILITY OR RISK OF SUCH LOSSES OR DAMAGES.